Sometimes called a Swiss or Physio ball, those large exercise balls you see in exercise videos and gyms are not just a fun and colorful diversion for your workout. 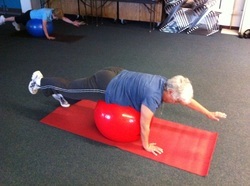 The ball is an excellent tool for improving core strength, balance, flexibility, and upper body strength. The ball forces the body to recruit both deep and superficial muscles to maintain stability during even basic exercise movements. Swiss exercise balls come in a variety of sizes ranging from 30 to 75 cm. Selecting the ball size that is right for you depends primarily on your height. When sitting on an inflated ball, your hips and knees should be bent at approximately a 90 degree angle, with your thighs parallel to the floor (see picture at left). Because you probably won't be lucky enough to get to try sitting on an inflated ball at a sporting goods store, use the following guidelines in deciding which ball size to purchase. I consulted multiple sources, including the book, Abs on the Ball by Colleen Craig (an excellent resource for instructors and students alike), and various companies that sell the balls. All of them offer a slightly different set of guidelines, so I consolidated the information, compared it with my own experience and how my class will be using the ball, and came up with the following parameters. Look for balls that are labeled burst-resistant (most balls seem to carry that label, so it shouldn't be too hard to find one). Make sure you check the size listed on the box. My preferred brand is Gymnic (available through OPTP.com), which is more expensive but holds its shape better (the rubber doesn't stretch out like other brands). The ball should come with inflation instructions and a pump. Follow those instructions. Balls are measured by their diameter (height from the floor) not by air pressure. Some balls come with a measuring tape to ensure correct inflation. Otherwise, use a yardstick. Do not overinflate your ball! If you are brand new to using the ball and think you might feel a little unstable on it, leave it slightly soggy. If you are heavy, start with a firmer ball. Store your ball in a cool location protected from the sun. The Relaxation Pose: A favorite part of the stability class! The Pointer: This exercise challenges core strength.